Catherine Elizabeth Middleton was born on 9 January 1982 at Royal Berkshire Hospital, Reading, Berkshire, England.1 She was the daughter of Michael Francis Middleton and Carole Elizabeth Goldsmith.2 Catherine Elizabeth Middleton was baptized on 20 June 1982 at St. Andrew's Church, Bradfield, Berkshire, England.3 She and Prince William were engaged on 16 November 2010. 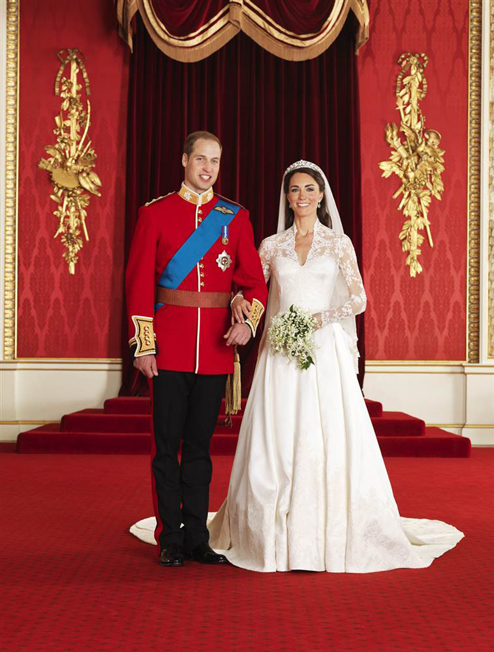 Kate Middleton married Prince William on 29 April 2011 at Westminster Abbey, London, England. As of 29 April 2011, Catherine Elizabeth Middleton was bestowed the title of Duchess of Cambridge. [S734] William Addams Reitwiesner, Catherine Middleton, page 3. Louis Horr Stough was the son of (?) Stough and Ada Veeder Horr. Michelle St. Martin was born on 3 November 1965. She was the daughter of (?) St. Martin and Darla Lou Van Dake. Michelle Fischbach is a Minnesota politician, a member and the current president of the Minnesota Senate, representing District 14, which includes portions of Benton and Stearns counties in the west central part of the state. Prior to the 2002 redistricting, the district also included portions of Morrison and Pope Counties. A Republican, she was first elected to the Senate in a 1996 special election held after the resignation of Senator Joe Bertram, Sr. She was re-elected in the Fall 1996 general election and, again, in 2000, 2002, 2006 and 2010. She was an assistant minority leader from 2001-2002 and from 2007-2008. She currently serves as the deputy minority leader. Beginning in January 2011, she has served as senate president, becoming the first woman to do so. Fischbach is currently a member of the Senate's Finance Committee, the Health, Housing and Family Security Committee, and the Transportation Committee. She also serves on the Finance subcommittees for the Economic Development and Housing Budget Division, the Health and Human Services Budget Division, and the Transportation Budget and Policy Division, on the Finance-Economic Development and Housing Budget Division with Health, Housing and Family Security Subcommittee for Housing, and on the Transportation Subcommittee for Airways, Waterways and Railways. Fischbach attended Woodbury High School in Woodbury, then attended college at the College of St. Benedict in St. Joseph from 1984-1986 and, later, at St. Cloud State University in St. Cloud, where she received a B.A. in political science and economics in 1989. She served on the Paynesville City Council from 1995-1996. She is married to Scott Fischbach, who is executive director of Minnesota Citizens Concerned for Life. She and her husband live in Paynseville and are the parents of two children. Roswell and Betsey were enumerated i the 1850 Leroy, Bradford Co., PA, federal census. He was 35, she was 24. Children in the household were 2 sons Arnell and Reuben. "R." and Betsey were again enumerated in Leroy in the 1860 Leroy federal census. He was 44, she was 33. Children in the household were Newton 8, Milton 5, and Burdett 1. [S182] Social Security Death Index (on-line), Ancestry.com, SSDI, Ancestry.com, SSAN 085-12-7314. Roswell Rude Rogers was born on 24 February 1816 at LeRoy, Bradford Co., PA.1,3 He was the son of Roswell R. Rogers and Minerva Loomis.2 Roswell Rude Rogers married Betsey E. Holcombe, daughter of Hiram Holcombe and Polly Wilcox, before 1849.1,2 Roswell Rude Rogers died on 10 November 1866 at LeRoy, Bradford Co., PA, at age 50. Mary Magdelina Hite was born in 1708. She was the daughter of Jost Hite. Mary Magdelina Hite married Jacob Chrisman in 1730. Mary Magdelina Hite died in 1768. [S182] Social Security Death Index (on-line), Ancestry.com, SSDI, Ancestry.com, SSAN 095-05-1512. [S182] Social Security Death Index (on-line), Ancestry.com, SSDI, Ancestry.com, SSAN 484-07-5655. [S182] Social Security Death Index (on-line), Ancestry.com, SSDI, Ancestry.com, SSAN 554-03-1563. Mable McKenna married Frank Edwin McGraw Sr., son of Andrew Henry McGraw and Ella Mae Nave. Child of Mable McKenna and Frank Edwin McGraw Sr.
Elizabeth Ann D'Agostino married Frank Edwin McGraw Jr., son of Frank Edwin McGraw Sr. and Mable McKenna. Child of Elizabeth Ann D'Agostino and Frank Edwin McGraw Jr.
Audrey Faith Perry was also known as Faith Hill. She was born on 21 September 1967 at Ridgeland, MS. She married Samuel Timothy McGraw, son of Frank Edwin McGraw Jr. and Elizabeth Ann D'Agostino, on 6 October 1996. Lydia Eager married Matthew Noble III, son of Ens. Matthew Noble and Joanna Stebbins. Lydia Eager was born on 20 January 1738/39 at Shrewsbury, Worcester Co., MA. Molly Phleps married Benjamin Eager Noble, son of Matthew Noble III and Lydia Eager. Molly Phleps was born on 9 December 1763. Hiram Newton Rogers was born on 7 January 1852 at LeRoy, Bradford Co., PA.1 He was the son of Roswell Rude Rogers and Betsey E. Holcombe. Newton was enumerated in the 1900 Marion, Linn Co., IA federal census. He was a widower, age 48. Also enumerated in the household was his son Burdett A. 21 and daughter-in-law Rose23; and his mother Betsey 74. Charlotte Noble married Charles Loomis. Charlotte Noble was born on 22 June 1787 at Westfield, Hampden Co., MA. She was the daughter of Benjamin Eager Noble and Molly Phleps. Fanny Loomis married Titus Pomeroy III. Fanny Loomis was born on 10 May 1810 at Westfield, Hampden Co., MA. She was the daughter of Charles Loomis and Charlotte Noble. Mary Bowers married Collins Pomeroy, son of Titus Pomeroy III and Fanny Loomis. Mary Bowers was born on 27 February 1848 at Granville, Hampden Co., MA. Minnie Elizabeth Coffin married Silas Cooper Pomeroy, son of Collins Pomeroy and Mary Bowers. Minnie Elizabeth Coffin was born on 7 October 1876 at Westfield, Hampden Co., MA. Bertha Frances Manson married Robert Bryan Pomeroy, son of Silas Cooper Pomeroy and Minnie Elizabeth Coffin. Bertha Frances Manson was born on 28 September 1905 at Gardiner, ME. Capt. John Hite was the son of Jost Hite.1 Capt. John Hite lived in 1748 at Shenandoah Valley, VA; 16 year old surveyor George Washington stayed with Capt. Hite while working in the Shenandoah Valley.